The old Slipway dates back to the late 1800’s. It was constructed to serve as a dry dock to service and repair mainly the tugboats of Port Elizabeth harbour. All that remains today is six concrete pylons and a steel slipway that extends from the beach to about 150m into the sea. 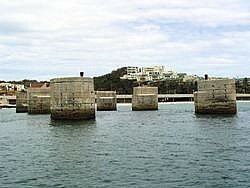 Depending on the tide a maximum depth of between 5 - 7m can be reached at the end of the slipway. 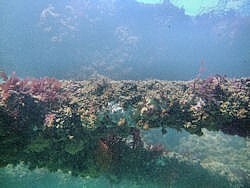 Although this is a easy dive site and a favorite among snorklers, care must be taken when diving here. Diving into or under the metal framework must never be attempted. Due to the easy access from shore it is often used for training and night dives. Octopus can often be found in the cracks and around the pillars. At night sea barbels and east coast rock lobsters can be seen. Large anemones in a variety of colours as well as feather duster worms can be found around the last pair of pylons.